So, this pretty poorly photographed pile of books represents my reading plan for the next few weeks and months. I’ve already started Parade’s End and will be reviewing each of the four novels separately before summing up at the end. 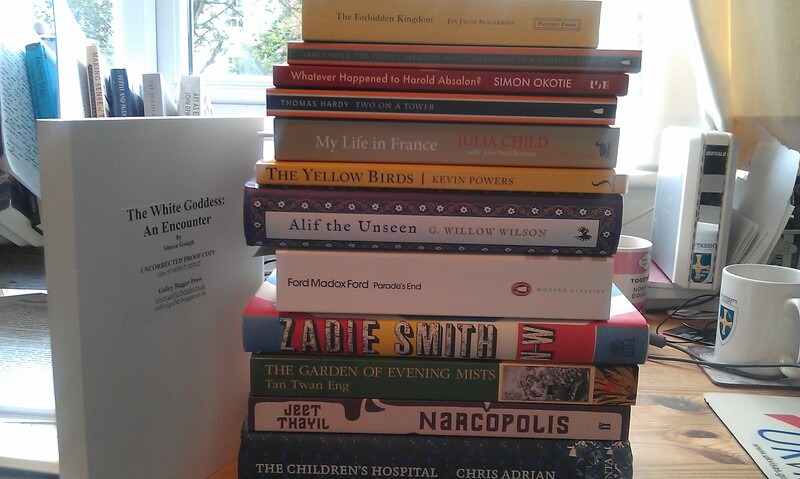 The Garden of Evening Mists and Narcopolis are the last of the Booker Longlist books which I have. I’m as yet undecided as to whether I will buy the remaining four novels to round out my Booker Series. The White Goddess, Alif the Unseen, NW, and The Yellow Birds all come out around the end of August and the beginning of September, so those are fairly high up the list as well. As is Simon Okotie’s Whatever Happened to Harold Absalon? and The Forbidden Kingdom from Salt and Pushkin Press respectively. I’m also continuing my reading of the Penguin English Library so as to bolster my woeful acquaintance with ‘classic’ literature – whatever that means. The mammoth The Children’s Hospital, which was released a few years ago in the US, looks very interesting (as well as having a great cover). Finally, My Life in France by Julia Child should make me both pretty hungry and yearn to wander some Left Bank book-haunted alley-ways in a dependably clichéd manner.